Always loved this song: lyrically, melodically, and in its arrangement. Every word is perfect. This version, from the Wings Across America tour of the mid-70s, finds Macca in great voice. Lutheran composer John Ylvisaker has written wonderful hymns, praise songs, and liturgies. He's been prolific. I Was There to Hear Your Borning Cry is his most well-known composition. It's a love song from God to the baptized. We will be singing it again this coming Sunday prior to a baptism. The singer here is John himself. Conventional animation involves artists creating backgrounds against which characters and objects move. Every move is separately drawn. It's painstaking work. Such animation has largely been supplanted by computer animation, the best practitioners of which are probably the people at Pixar. But a project on the life of Vincent Van Gogh, Loving Vincent, is revolutionizing conventional animation. Instead of characters and objects moving against largely unchanging backgrounds, this movie about the painter uses a separately produced painting for each and every frame. It's an appropriate way to approach Van Gogh's life, the images inspired by his painting style. And the images shown here are stunning. And since Van Gogh is my favorite painter, I don't think I would be easily stunned. The project is still in production apparently. I look forward to seeing the finished product. Here's a link to more information on Loving Vincent, also containing a slightly longer version of the trailer. Thanks to the Daily Dot for showcasing this effort over on Facebook. That's how I learned of it. Yesterday brought the last of the midweek Lenten series on Christian discipleship, Reaching Up, Reaching In, Reaching Out, that's been presented to the disciples of Living Water Lutheran Church in Centerville, Ohio, this year. Here are links to all five installments. There's one more week to go in this Lenten season. Next week, Holy Week, will bring commemorations of Maundy Thursday, when Jesus instituted Holy Communion and commanded His followers to love each other as Christ loves us, and Good Friday, when Jesus offered Himself as the perfect sacrifice for our sins. Good Friday is "the first day" of the Triduum. The "third day" is Easter, when Christians celebrate the victory over death that Christ wins for all who repent and surrender to (believe in) Him through His resurrection from the dead. Plan on experiencing Holy Week and Easter at a congregation near you. If a skeptical friend were to ask us as Christians what we think is God’s most basic character trait, we probably would say love. After all, 1 John 4:8 tells us, “Whoever does not love does not know God, because God is love.” At the very center of God's character then, is love. More than anything, we see that God loves not by His words, but in His giving. God gave life to us, a gift none of us deserved. We know about God’s love because God gives. And when we become Jesus’ disciples--when we let Jesus reign over our lives--we’re called reach out to others in Christ’s name through lives that reflect the generosity God has shown to us. Giving involves our whole beings: giving our time, commitment, energy, for example. But giving does involve money too. Personally, this has been a hard part of my faith in Christ to live out. For lots of reasons, by the time I hit my teens, I was a tightwad. I could list all sorts of contributing factors, but there’s really a simple explanation for the stinginess that characterized my young adult years: I was an atheist then and didn’t know that my brain and my brawn, the means by which I earned my income, came from God and therefore, everything I had was a gift from God. But even after I came to faith at age 23, giving was hard for me. And yet, in response to God’s love in Christ, we are to be generous. But when we think that, we underestimate our God. When it comes to the provision, love, and grace of God, there’s always more where that came from. We can never outgive God! In Old Testament times, God’s people were commanded to give the first 10% of their income-a tithe-to support the priests at the temple. But in the whole history of ancient Israel, the people rarely did that. It was true that many of the priests were corrupt. So, they may have thought they had a good excuse for not giving the tithe. But, the corruption of the prophets didn’t invalidate God’s command that His ancient people give in response to His grace. This is the only place in Scripture where God tells His people to test Him. Be generous, part with what you don’t think you can part with, God was saying, and see if I don’t look after you. He is saying that giving is a way in which we express thanks to Him for grace and a way in which we express faith in God’s ability to keep caring for eternity. Through the years, God has sent me living examples of giving disciples for me to imitate. At the church I served in Cincinnati, we used to have a message in the worship bulletins: “We ask our guests not to make an offering. It’s our privilege to welcome you today.” That message was wrong for several reasons. (And I was the one who insisted it needed to be included in the bulletin!) One is that it saw the church in institutional terms, as though the offerings we give in worship are all about the care and feeding of the church as an institution. Much of our offerings do go to support the work that congregations do to fulfill Christ’s great commission of making disciples. But more than anything, we give because as believers in Christ, we need to give. Giving takes our attention off of ourselves and puts it onto God and neighbor. Giving also expresses our trust in God. That's because years before, she had left an abusive marriage, was raising a young child on her own, and was working a job that allowed her to barely eke out a living. But she knew that God was sustaining her through her challenges and she decided then that she would join a church and give, even of her money, 10% of her meager income. The New Testament doesn’t designate a required amount for our giving, but what that woman found, as she later told me, was that as she trusted God, “God took care of 100% of my needs on 90% of my income.” That lesson stuck with me. Our call is to reach up, reach in, and reach out because we follow a God Who saves us by grace through faith in Christ. My son shared this today over on Facebook. Heisenberg's experience was exactly my experience, though I certainly never delved into science as deeply as he did, obviously. 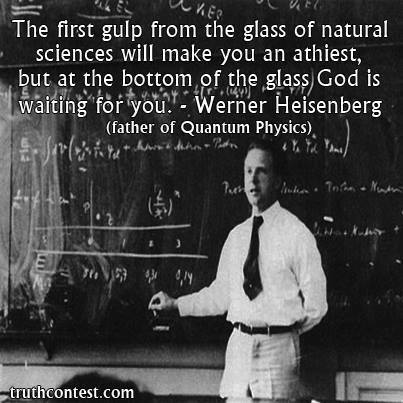 I became an atheist in my early teens, when I first began to really learn about science. But after I learned more and recognized that knowing about the universe didn't mean a person understood the universe, I became more open to faith in God. Science answers useful questions like what, when, and how. But it is God who must reveal the answers to the most important questions about our universe: who and why? This He does in Christ and in His Word, the Bible. Faith isn't contrary to reason. But you cannot reason your way to God from the data in the observable universe. You can't say, "There's a tree. I know how it works. Therefore, there is no God." Nonetheless, the awe that looking at the universe and its elegant mechanics revealed by science's questions left me open and willing to believe in the God revealed in Christ. God creates faith in Christ in the lives of those who are willing to believe, but belief in the God we cannot see is a miracle of grace. Faith is God's gift to the willing. It's a miracle that, with what I know about life and death and the world, I nonetheless believe in God and trust God in the flesh, Jesus, to be my Savior and that the life He gives to forgiven sinners like me beyond the grave, gives me confidence to live today. 1 Corinthians 12:3 says: "...no one who is speaking by the Spirit of God says, 'Jesus be cursed,' and no one can say, 'Jesus is Lord,' except by the Holy Spirit." God's Holy Spirit takes our willingness to believe each day and turns it into faith. And Hebrews 11:3 says: "By faith we understand that the universe was formed at God’s command, so that what is seen was not made out of what was visible." When you know the God made plain in Jesus, your awe of the mechanics of the universe uncovered by scientific discovery only increases, as does your appreciation of God's grace. I was able to walk right in and vote at my polling station today. Poll workers said that the turnout had so far been slightly higher than average. Since we vote in a station of blue collar precincts, I expect that if this station gets a rush of voters, it will happen between now and the closing of the polls this evening. Apparently, the place was fairly crowded this morning. A D.C.-area reporter who interviewed me after I voted said that, earlier in the day he had stopped by the station and only two of the voters of the mass with whom he had spoken had not voted for Trump. He said he had spoken with one person who voted for Clinton and one for Sanders, none for Kasich. He expected to run into different results in Centerville and Beavercreek, where he was going to visit later. Ohio requires you to declare your partisan affiliation in order to vote for candidates for the nominations of those parties. I have always liked this because, I feel, if you're not more or less committed generally to one party or the other, you shouldn't have a say in who is nominated by a party. The fact that Ohio does things in this way gives the advantage to Kasich among Republicans, since much of Trump's support is coming from the ranks of independents and what used to be called "Reagan Democrats." It also gives Clinton a slight advantage in Ohio, since independents and first time voters (or would be first-time voters) are important to Sanders. While it's easy to change partisan affiliation in Ohio, people who have tended to vote in one party's primary in the past--even if they don't vote straight tickets in the general election, will tend to vote in the same party's primary this year. The polls, of course, show that both Democratic and Republican races are tight. African-American friends, remember how Dr. King and others worked hard and gave their lives to bring the vote to all people. Fellow Christians: I don't know how God wants you to vote. I've never believed that God has a political party. But because of God's command that we love Him and our neighbor, I believe we owe it to God to cast responsible and informed votes, to pray for our country, and to pray for our leaders.